How do we know that the First Doctor was indeed the first? How do we know that the First Doctor portrayed by William Hartnell was indeed the first Doctor, and not a reincarnation of a previous one, that for example the Doctor wanted to forget (something already seen with the War Doctor), and that's why he never talks about it? Was this fact (that the first was actually the first) actually explicitly stated anywhere during the show, or it was only implied (like when talking about the number of reincarnations the Doctor already had) during the course of the show? When was the first time this was stated? There have been a few instances on the show that seem to indicate he was the first. The Third Doctor story "The Three Doctors" (transcript here), in which the Third met up with the Second and First, has the Time Lord President tell an underling to "Show me the earliest Doctor", after which they cut to a shot of William Hartnell's First Doctor. The Fourth Doctor story "The Deadly Assassin" established that Time Lords can only regenerate twelve times (so they can only have thirteen bodies over the course of their lives), and in the Fifth Doctor story "Mawdryn Undead" (transcript here), the Fifth Doctor says "I can only regenerate twelve times. I have already done so four times." So, if he's telling the truth this would indicate the first five Doctors seen on TV really are his first five incarnations. DOCTOR 1: Me? Yes. Yes, I'm afraid so. Regeneration? DOCTOR 1: Goodness me! So, there are five of me now! Shortly after this, the First Doctor introduced himself to the Fifth Doctor's companion Tegan by saying "As it happens, I am the Doctor. The original, you might say." We tried to get famous actors for the faces of the Doctor. But because no-one [sic] would volunteer, we had to use 'backroom boys.' And it is true to say that I attempted to imply that William Hartnell was not the first Doctor. It is quite obvious that when the story was made, the faces on the screen during the mindbending contest were to represent the Doctor. The mindbending contest at the end of part four proves conclusively that the Doctor regenerated multiple times prior to William Hartnell's Doctor. While this was apparently what the production team intended to imply, the overwhelming weight of evidence offered throughout the rest of the series contradicts this. For instance, Time Lord dialogue in The Three Doctors specifically establishes that the Doctor as portrayed by William Hartnell is "the earliest Doctor"; further evidence provided in Mawdryn Undead, The Five Doctors, the 1996 TV movie, The Next Doctor, The Lodger, The Name of the Doctor, and The Time of the Doctor) (among others) establishes that all of the Doctor's incarnations are accounted for in his televised adventures. There's already a lot of great research here, but perhaps there's a theory that fits all of this together if it comes off as plausible. Many things in reality can be represented by harmonic systems, progressing a period and repeating or evolving. Perhaps each regeneration cycle is less of a full life span and more of a single period in a much longer wave. So at the end of each cycle, the Timelord reaches a point of unity and will take on a new "title" or name. It's a larger regeneration with less continuity. This doesn't account for everything, but it's food for thought, though. Edit: Possible evidence taken from Why couldn't Clara see future incarnations past the "11th" doctor? From episode 239 "The Name of the Doctor" Inside The Doctor's grave, we are shown a beam of light which is said to be "the scar tissue" of his journey through time. The Doctor describes the light as both his past and his future. "But I never saw that one. I saw all of you. Eleven faces, all of them you! You're the eleventh Doctor!" Why was she unable to see the Peter Capaldi doctor or any other Doctor that followed? This would make sense. Counting The War Doctor and Ten's regeneration into himself, Eleven has already gone through twelve regenerations. If each cycle has only these twelve regenerations, the reason that Clara couldn't see any farther to Peter Capaldi is that he is the first in a new cycle. Again, this doesn't reconcile everything, but it's some speculative evidence at the very least. Unless necessary, I am loathe to resort to out-of-universe explanations for in-universe events. Such explanations usually amount to "Someone screwed up." For the "pre-Hartnell" images in the Brain of Morbius, no out-of-universe explanation is necessary. The Doctor has said or implied several times that the Harnell The Doctor is the first. At least one is what judges call an "excited utterance". Hartnel The Doctor in The Five Doctors: Goodness me! So, there are five of me now! The Matt Smith The Doctor is at least the eleventh. The mind-bending game included more than two "pre-Hartnell" images. Since they could not all be pre-Hartnell images, I infer that none of them were. Morbius did not recognize them, so they were not his images either. Morbius had believed that the Hartnell The Doctor was the first The Doctor, but the images persuaded him otherwise: "How many of you are there?" At the time, the answer was four, just what Morbius had thought it was. From the preceding, I infer that The Doctor "cheated". The images were things made up by The Doctor to avoid losing the contest. That The Doctor or anyone else could do that was not something that Morbius had considered. Edit: I viewed the Morbius clip. It seems I was wrong about Morbius's knowledge and beliefs about The Doctor. That said, the conclusion still stands. The "pre-Hartnell" images could not all have been pre-Hartnell images and they were not Morbius images. They were "cheats" generated by The Doctor. The Time of the Doctor firmly establishes that Hartnell's Doctor was indeed the First. In dialogue with Clara, The Doctor explains that he is the 11th Doctor, not including the War Doctor. This makes twelve total incarnations. The Doctor further explains that the first time the Tenth Doctor regenerated, he didn't change his face for "vanity reasons", totaling twelve regeneration cycles. By deduction, Hartnell is the First Doctor. Why couldn't Clara see future incarnations past the “11th” doctor? In Doctor Who S6, who are The Silence, really? After the events of 'The Big Bang' what is the state of Gallifrey? Was history changed in The Day of the Doctor, or was Gallifrey always saved? Is the painting “Gallifrey Falls No More” actually Gallifrey? 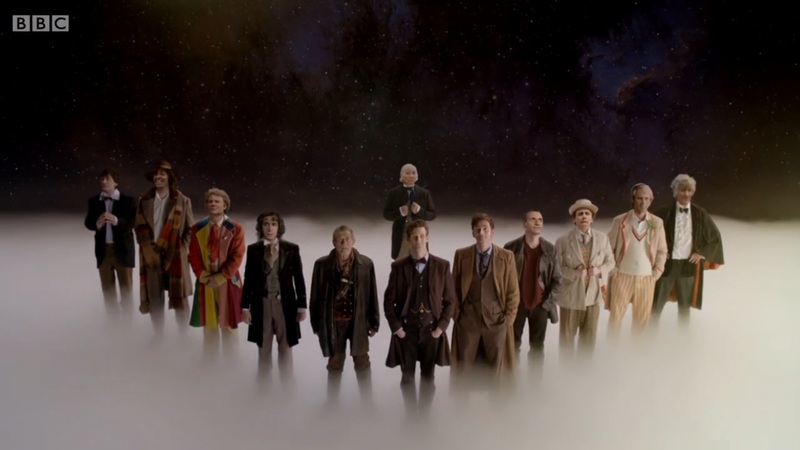 Why do the first 10 Doctors (Hartnell-Tennant) have to forget the events of the 50th anniversary special, but the 11th and 12th Doctors do not? Where did this theory about the Series 10 vault originate? Were the daleks' enemies, the thals, named after neanderthal man? If the Doctor was the last of the Time Lords, what happened to Susan?